After Amy’s June, 2011 birthday, I used one of the plates from our little family birthday party for her (yup! We decorated our dining room in Pirates 4 stuff) as a reference for a new pencil portrait. I had purchased a brand new pencil set earlier this year (6H to 6B), so I used that, along with an Ebony Jet Black pencil, to get the various shades and deeper blacks. 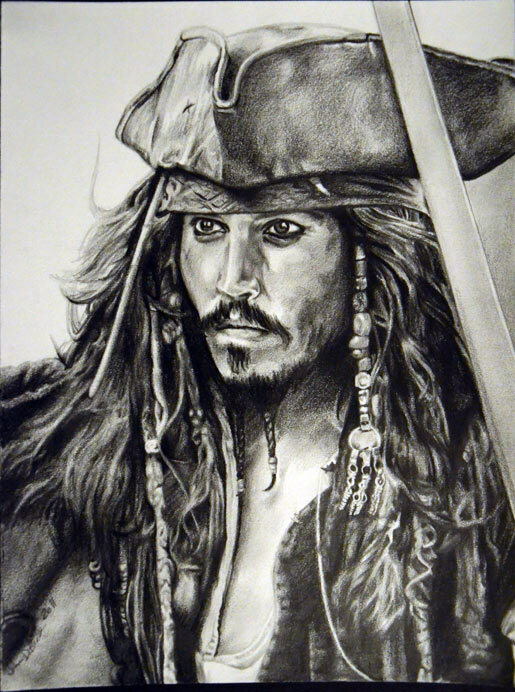 This was my first attempt at drawing Johnny Depp as Jack Sparrow from the Pirates of the Caribbean films. This is really great. Have you ever considered a series of horror icons? Freddy, Jason, Pinhead, Leatherface, Michael Meyers,..etc. I’m sure you’d rock it.